Taken with Teal is my most recently acquired color - yes, I know, I should have had it long before now! But to be honest, I wasn't sure if I really liked it. Well, once I actually had it in my hot little hands - I now love it! 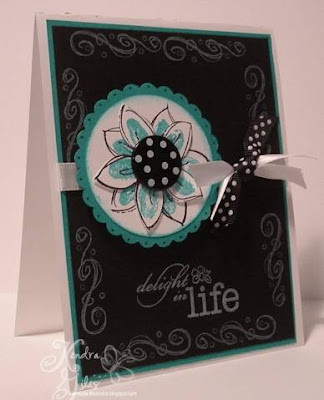 lol Delight in Life was calling out to me yet again and I decided to pair the Taken with Teal using black and white and my white craft ink. The large polka dot brad from Hobby Lobby and polka dot ribbon from Wal-Mart were the perfect touch to polish off this card. 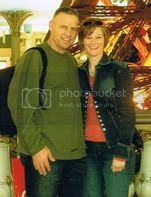 I am planning on renovating my kitchen this weekend (painting, laying new flooring, etc.) so I probably won't get much if any stamping done (what is wrong with me? lol), but.........I do have the next few evenings free and am still needing lots of cards for some tins I am working on - so hopefully I will have some new creations to post. :) Thanks to all of you who check in daily and leave me some wonderful comments and emails.......they are all appreciated! Hey Kendra! What a beautiful card. I love how you used black as the background and stamped with white. The polka dot brad and ribbon is absolutely perfect. The Taken with Teal looks great with the black and white. FABULOUS!!!! I found your blog yesterday. You have some great cards! I just wanted you to know you have a new fan. Thanks for the inspiration and beautiful cards! Awesome combination! Keep up the good work. Pretty Kendra!! Love your style. I think I could pick out a Kendra card in a crowd now...and that's not a bad thing at all!! I just LOVE it! Cute polka-dot button and I always love all your ribbons of course. :0) I sat down with my punches today. I'm going to post a cute one soon, but I'm waiting for the CE to dry! Oh super cool! Love your color scheme and the cool way you popped that flower!!! Fabulous! FAB card Kendra... you are SO creative I am in awe. Keep'em coming! http://kismetartlife.blogspot.com/ She's got an bandaid tin in the mix that would be fun to alter.! Beautifully striking card. I love the polka dot accents. Perfect touch! I love the color combo. What a beautiful card. Great job! Beautiful card, Kendra! I can't believe you haven't had Taken with Teal before now. I love it and love how you've used it here! Girl, you are so talented! I love checking your blog everyday! How's about you be the guest stamper on my blog this week? Just let me know if that works for you and what artwork you'd like me to feature! Hugs and smiles! This is such a beautiful card Kendra! Love it! Another gorgeous card! I love the teal and black together! WOW! What a beautiful card...I love it!!! Noticed your new banner too...very nice!! I can't believe this is the first time I've visited your blog. I love your style. I'll have to add you to my list of "to be read frequently!"